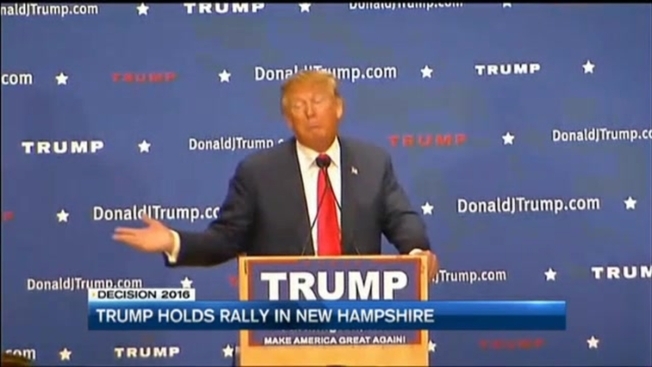 With the New Hampshire primary just two weeks away, Donald Trump told the crowd in the Farmington High school gym on Monday what he needs to do in New Hampshire on Feb. 9. "It's so important, we need big numbers, we have to get a mandate… We are unified." Trump's poll numbers show he has every reason to feel confident. The latest polls out of New Hampshire give him a double-digit lead over his Republican opponents, though Ted Cruz has been nipping at his heels in Iowa - making Cruz, Donald Trump's public enemy number one. "Cruz has a lot of problems. He's fallen in the polls, he's concerned and he should be," Trump said. Trump also continues to take down his favorite opponent, Jeb Bush. "Jeb, your mother is not going to help you negotiate with China," he quipped. And Trump lavished praise on his new BFF, Sarah Palin. "She likes what we're doing. She's a fine woman, a loyal woman. And she is smart," he said. Brandy Chagnon of Rochester said, "I like that he has no filter, he kind of will say it like it is. Misty Doherty of Portsmouth said, "He's different. He is someone who really tells us how it is and how we need to hear that and we need to start doing things different." Kathy Mihachik of Chichester said, "I like Trump. I wanted to hear what he has to say. If there's anything new that he has to say, then I want to hear it personally, but just because I like the guy." That last woman may have been a bit disappointed. Not a lot of new material, though last Saturday, Trump made a comment that his supporters are so loyal he could shoot someone on Fifth Avenue and they would still vote for him. There was no mention of that on Monday night and no mention of another person he often speaks up on the campaign trail - Tom Brady.